As a motorhome insurance specialist we’re always analysing the types of claims being made by motorhome owners. We saw claims from reversing accidents increase by 78% in 2010 versus the previous year and have so far seen a similar amount of incidents in 2011. Common claims include where motorhomes have reversed into stationary objects such as walls, trees, driveposts, garages and parked vehicles. 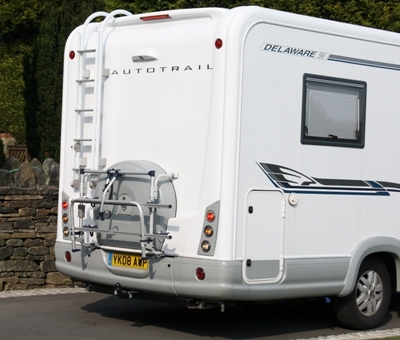 The average cost of repairing a motorhome after a reversing bump is over £1300. A reversing camera or sensor can therefore be a great idea for motorhomes of all sizes, as unlike cars most motorhomes don’t allow you to look through the back window making reversing that bit trickier. Such devices also save the driver time and effort by making it much easier to park your motorhome, or manoeuvre onto a tight pitch. Reversing cameras, and particularly sensors, have been around for a long time in the car market. More and more new motorhomes include such devices as standard. Reversing cameras are fitted to the rear of your motorhome and these relay live footage to small TFT LCD monitors inside your motorhome cab. Reversing sensors are often slightly cheaper; here small sensors are usually inserted or stuck onto your rear bumper and then use ultrasonic technology to emit a series as beeps inside the cab. The beeps get closer together as your motorhome gets closer to an object. Sometimes reversing sensors are also accompanied by a basic LCD visual display that gives a pictorial indication of how close your motorhome is to an obstacle. There are a number of third party devices available that can be retrofitted to motorhomes which don’t currently have reversing cameras or sensors fitted. As with most motorhome accessories the price range is fairly wide and there are both devices which can be DIY fitted, or which need to be fitted by a professional. As these devices often involve wiring and holes being drilled into the motorhome shell during fitment our advice would be to choose a professional fit via a motorhome dealer or accessory specialist. Caravan Guard research has shown that the fitting of a parking sensor or rear view camera can reduce the likelihood of a motorhomer making an accidental damage claim. It’s for this reason that we offer a 2.5% insurance discount for motorhomes with either a reversing camera or reversing sensor/s fitted. All we ask is that the device is of a proprietary make (i.e. not homemade) and that you keep the device in full working order. On top of that, saving yourself from a reversing accident could also help keep your valuable motorhome insurance no claims discount intact. I just checked your policy and you are currently receiving the reversing camera discount on your SeA Sloop5, and this will automatically carry on at your next renewal. If you have any further questions though don’t hesitate to give us a call – one of our Insurance Advisers will be more than happy to run through the safety and security discounts you are currently receiving. “A reversing camera could save you money, hassle and your insurance no claims bonus”. I refer to your quote above! I have a SeA Sloop5 2007reg, which is based on a LWB Fiat Ducato. I fitted a wide angle CCD reversing camera in the rear bumper of my motor home, with a CCD rear view camera at a high level. The view on the on the 7″ TFT monitor is automatically switched to the low level reversing camera when reverse gear is selected. This has proved to be an excellent aid to accurate aid to accurate and safe reversing. I will be pleased to receive my 2.5% discount as promised by you. Good advice, I thought I could get away without a reversing camera, until I was reversing and hit a raised flowerbed that was just out of site behind me – the tiniest bump you could imagine, but it cracked back and side bumpers !! Caravanguard handled claim brilliantly (I had the reversing camera fitted when repair was done), sadly renewal was a huge increase (x3.5! ), so I regrettably moved to another insurer.